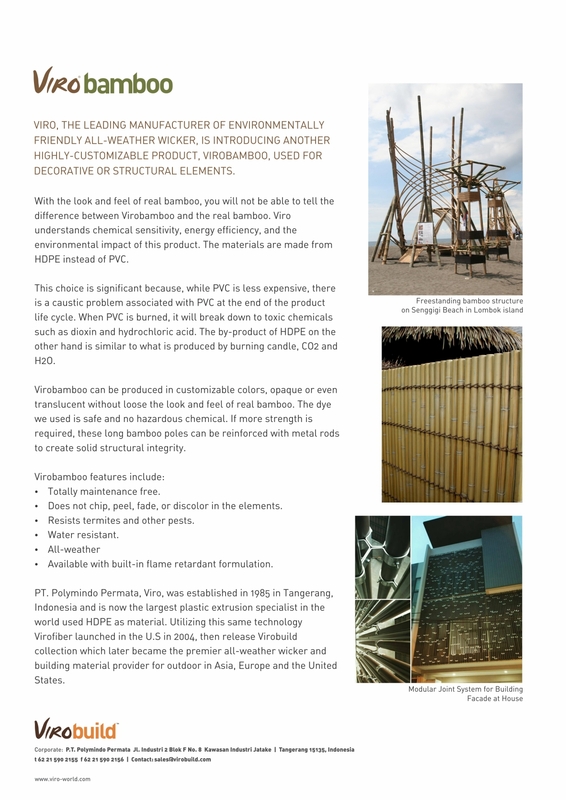 Viro, The Leading Manufacturer Of Environmentally Friendly All-Weather Wicker, Is Introducing Another Highly-Customizable Product, Virobamboo, Used For Decorative Or Structural Elements. With the look and feel of real bamboo, you will not be able to tell the difference between Virobamboo and the real bamboo. Viro understands chemical sensitivity, energy efficiency, and the environmental impact of this product. The materials are made from HDPE instead of PVC. This choice is significant because, while PVC is less expensive, there is a caustic problem associated with PVC at the end of the product life cycle. When PVC is burned, it will break down to toxic chemicals such as dioxin and hydrochloric acid. The by-product of HDPE on the other hand is similar to what is produced by burning candle, CO2 and H2O. Virobamboo can be produced in customizable colors, opaque or even translucent without loose the look and feel of real bamboo. The dye we used is safe and no hazardous chemical. If more strength is required, these long bamboo poles can be reinforced with metal rods to create solid structural integrity. Does not chip, peel, fade, or discolor in the elements. Resists termites and other pests. Available with built-in flame retardant formulation. PT. Polymindo Permata, Viro, was established in 1985 in Tangerang, Indonesia. It is now the largest plastic extrusion specialist in the world using HDPE as material. Utilizing the same technology, Virofiber launched in the U.S. in 2004 then released Virobuild collection which later became the premier all-weather wicker and building material provider for outdoor in Asia, Europe, and the United States.